Those of you who have eaten loukoumades will know what a delicious treat they are! There are cafes here that serve them and you can just walk in off the street and order a plateful of them to eat. However, home made loukoumades are much cleaner and tastier. They are ideally eaten as they are made - nice and warm with the syrup all over them! 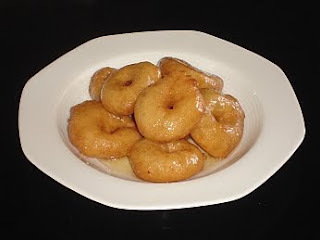 To be honest, they are more of a winter dish, but that plateful of loukoumades in the photos disappeared down my throat in no time at all even now in the middle of summer! Not a problem! In a bowl dissolve the yeast in the tepid water, along with the sugar and salt. Add the flour and dissolve it well in the water with your hands. Add the 150ml oil and stir well. Cover it and let it rest in a warm place for at least 1 hour, to rise. Prepare the syrup by boiling the sugar and water for 5 minutes. Remove from the heat and add the honey. Put the 500 ml oil in a deep pan and heat. Turn the dough in the bowl a few times with your hands. Take a handful of dough and, with your hand in a fist, squeeze until the dough comes out as a ball between your thumb and index finger. Using a tablespoon which you have dipped in a small bowl with oil, scoop this ball and place in the deep pan to fry. If you want them to have holes in the middle (see photo), then there is a technique using your fingers instead of a spoon. Using the thumb and middle finger of your free hand, take the dough from the hand that is holding it and press a hole in the middle with your index finger before putting it in the pan to fry. Repeat this process, dipping the spoon into the oil each time, until you have covered the surface of the oil in the pan. Once the one side has become golden brown, turn the balls over in the oil so that the other side gets done. The process should only take about 2 minutes or so. Remove the balls and place on kitchen paper to drain. Put all the loukoumades (balls) in a large bowl and pour the syrup over them. Holding the bowl with both hands, shake the loukoumades so that the syrup goes over them all. Arrange the loukoumades in serving dishes. Mix the icing sugar and cinnamon well and sprinkle evenly over them. And they taste delicious too! Thanks! Mine didn't turn out as nice looking as yours but they sure were good. Thanks for the recipe. Martha - I'm so glad you enjoyed them! It just needs a little bit of practice. Great!! !It is one of the most famous dessert, especially at holidays, Christmas and New Years eve. Looks so sweet. I never had a recipe like this. Its unique, wet donuts.. These were ok, but I found the dough was pretty bland and not at all sweet. Next time I will definately increase the sugar in the dough. Wow, Nice looking as yours but they sure were good. Thanks for the recipe. Great!! !It is one of the most famous dessert, especially at holidays, Christmas and New Years eve. 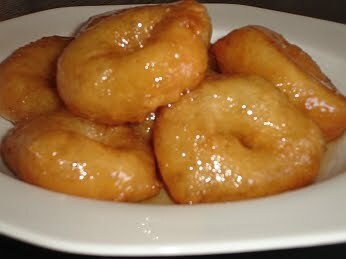 In Corfu, it is the most favorite dessert at Saint Spyridon's day, which is the most glory day on the whole island! They could be even without the eggs. And without putting on the honey surop but some powdered sugar with a lot of cinnamon!!!Delicious!!! WoW! This was just perfect! My family loved it and it was just as good as going out to a restaurant. Perfect! I think It just needs a little bit of practice. WoW! This was perfect! My mother loved it and it was just as good as going out to a restaurant. I found the dough was pretty bland and not at all sweet. Next time I will definately increase the sugar in the dough. This for the recipe anyway. Allison, the dough doesn't have much sugar because it's the sugar and honey in the syrup that sweetens it. Anyway, I guess it's a matter of taste!